Prices are trending flat to lower this morning after some big losses yesterday. As we noted earlier, it’s common for prices to surge ahead of a storm and decline when the storm makes landfall. Crude prices are currently trading at $68.19, down 40 cents from yesterday’s close. 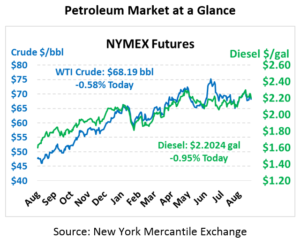 Fuel prices are in the negative as the risk to major pipeline infrastructure abates. Diesel is trading at $2.2024, down 2.1 cents from yesterday’s close. Gasoline prices, which peaked above $2.04 this week, are currently trading at $1.9701, down 2.3 cents since yesterday. Oil markets are generally looking at a few major factors this week: hurricanes, trade, and Libya. Of course, things are cooling off on the hurricane front given Florence’s weakening to a Category 1. US-China trade remains an on-going concern for markets, though developments have been light this week. While China welcomed an offer from Trump to resume trade talks, there’s no credible evidence these talks will be more successful than the last. Finally, Libya was rocked by instability earlier this week after a shooting at their National Oil Company headquarters, but the event has had no impact on Libyan production. Editor’s Note: Today’s Week in Review article will be replaced by a separate Storm Alert detailing progress from Florence.